While hidden from the road in the La Jolla UTC area, Cafe Japengo should not be missed. 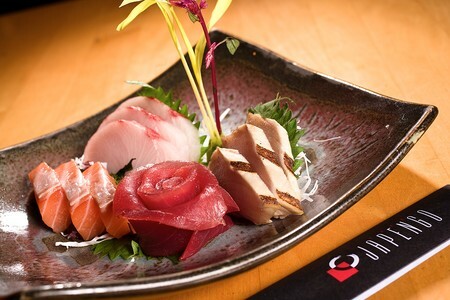 The upscale restaurant offers what is consistently dubbed the best sushi in San Diego as well as inventive Pacific Rim Cuisine. 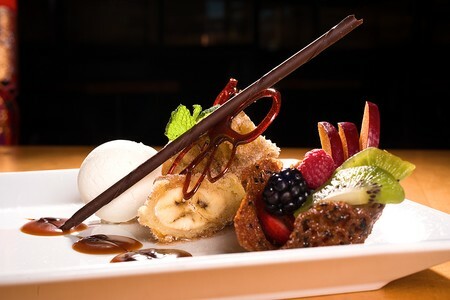 Executive Chef Jay Payne excels in crafting fresh, often exotic ingredients in innovative ways, with tantalizing dishes that almost threaten to overshadow the sushi. However, with Sushi Chef Jerry Warner’s 17-year tenure, and unrivaled creativity, the fresh, inspired sushi offerings more than hold their own. Guests looking for an especially unique experience should sit at the sushi bar, where Chef Warner crafts custom-made offerings not on the menu. While known as one of the area’s best sushi restaurants, Cafe Japengo boasts a dizzying array of offerings that spans far beyond sushi. With two chefs, two kitchens, and two menus—one for sushi and the other for modern, Japanese-inspired Pacific Rim cuisine—the La Jolla restaurant could easily survive as two distinct establishments. While each cuisine stands alone, relying on quality ingredients, expert preparations, and a blend of traditional and modern inspiration, it is the mix-and-match possibilities that make this 17-year old institution a gustatory dream. Arriving at Cafe Japengo early one weeknight, we effortlessly valet parked our car just steps from the entrance. Walking past the generous outdoor patio, we stepped into an atmosphere of serenity and calm. Textured shades filtered the last of the evening’s light, while dozens of translucent paper lights created an unobtrusive glow. We were led past the sushi bar and a row of booths to the main dining room, where a bamboo garden in a bed of polished black rocks lined the back wall. 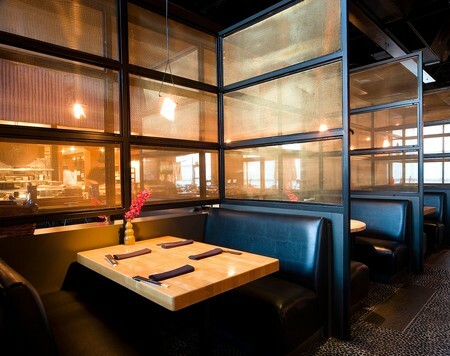 Sheer, gold mesh screens rose above the booths, separating the restaurant from the bar area, where an attractive crowd was gathered for the nightly happy hour. Square tables were set askew from the dining room’s walls, ensuring every seat had a view of either the soothing bamboo wall or the open kitchens. 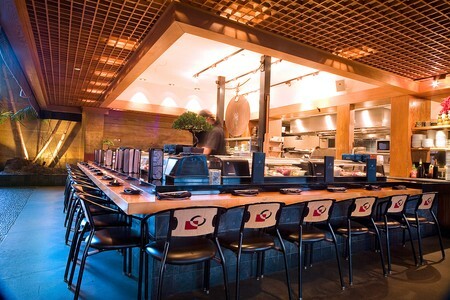 The open kitchens—a sushi bar run by Executive Sushi Chef Jerry Warner, and a hot kitchen run by Executive Chef Jay Payne—served as a visual metaphor for two starkly different yet intertwined cuisines. Where the sushi chefs don all-black outfits, work amid dim light and dark wood countertops, and entertain a crowd, the kitchen cooks are clad in white, work amid steel, bright lights, and firing ovens, and scurry to and fro in a professional frenzy that leaves no time to pause and talk to guests. Our server, Ramon (who goes by Ray) seemed completely in his element. After greeting us, he began a well-rehearsed “run down” of the sushi menu that would have put even the most tepid, inexperienced sushi eater at ease. Seamlessly, he brought our attention to the hot menu, as well as to the tea menu and wine list. While there was no doubt we would sample both sushi and hot fare, we had a bit of trouble deciding among beverages. The Japanese beer and sake selection offered traditional accompaniments, but the modest list of excellent wines was tough to pass up. We opted to begin with sake, then turn to wines to accompany the rest of our meal. The Flight of Sake—a trio of brews that span the range from sweet to dry—is an excellent option for the indecisive. Two steel towers arrived, holding curved, blue-tinted sake glasses that looked like falling rain drops. On the bottom rung sat a glass of Hitori Musume, a Junmai Nigori (pure, unfiltered) sake and the sweetest of the three. Following were two Junmai Ginjyo (pure, premium) sakes: slightly dryer Meibo Midnight Moon, and Momokawa Silver, an Oregon-brewed sake and the most dry of the flight. Instructed to sample from sweet to dry, we set to work lifting these rain drops to our lips and letting the pure, perfect liquid wash over our tongues. Our first dish came from the Salads section of the raw menu. 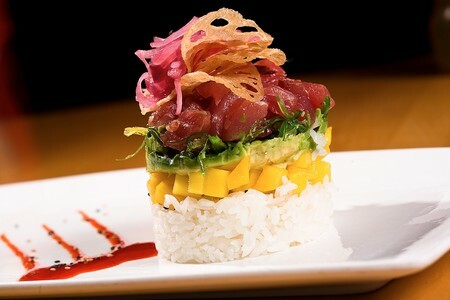 The Ahi Poke Martini featured thick slices of yellowtail tossed with halved plum tomatoes, avocado, cilantro, sesame seeds, and seaweed all mixed in a black bean ponzu sauce. The dish was a rainbow of flavors across the taste spectrum: the black bean sauce was both sweet and spicy; the sesame seeds dry and woody; the tomatoes, avocado, seaweed, and cilantro tart, creamy, crisp, and earthy, respectively. With so many disparate elements, each bite was a satisfying mouthful. The fish, of course, would be our first glimpse at the phenomenal quality that would weave throughout our meal. We moved on to a trio of hot appetizers, as Ray delivered glasses of Honig Sauvignon Blanc from Napa. The crisp, mineral-y and almost smoky wine would indeed prove a better accompaniment than any Japanese beer. A long platter arrived, holding three appetizers that spanned the range of textures, flavors, and culinary influences, showcasing the kitchen’s versatility. Two plump, Duck Pot Stickers sat atop a thick mint coriander pesto, the translucent dough tempting us to slice into the generous filling. The duck proved delicate and flavorful, although it was the pesto—an inspired combination of herbs bursting with freshness—that was the surprising highlight of the dish. The Lobster Dynamite, despite its name, was the farthest departure from Japanese cuisine we would taste all night. Served in a ramekin (usually as part of the “Lobster Lobster Lobster” appetizer), the rich, baked ragout of lobster, shitake mushrooms, and tomatoes seemed inspired by classic French cuisine. The seamless amalgamation of ingredients ensured that no one stood out; instead, each tender bite was a comforting blend of rich flavors. The Curry Dusted Calamari, served atop bed of rice noodles and slivered grapes and tossed with Thai lime vinaigrette, are so popular Chef Payne described the dish as selling “through the roof.” The tender calamari, fried to just crisp with a hint of spicy citrus, certainly lived up to their reputation; it took plenty of restraint to save room for the rest of the meal. We would move to sushi next, although Chef Warner’s careful artistry would leave us with a brief pause—the menu suggests a 45 minute preparation time on busy nights. Indeed, I noticed that the tables around us had quickly filled: an excited buzz of conversation now mingled with the Thievery Corporation soundtrack. Young professionals seemed to bask in room’s the hip vibe, while more seasoned guests—mostly couples and business travelers—seemed not to mind the room’s energy. Between tables, the black-clothed staff moved gracefully, replacing a chopstick here, a napkin there, removing stray drops of soy sauce to keep tabletops immaculate. As our own chopsticks were being replaced, Ray returned with our wine pairing: a crisp, slightly sweet Torre Rosazza Pinot Grigio from Friuli. The Italian wine, while untraditional, would prove a surprisingly good match for the sushi. Rarely do I find a plate too beautiful to disturb, yet the sushi platter that arrived was just that. The plate itself was barely visible, topped with a dazzling array of colors, textures, and forms. Natural materials—a glistening strip of banana leaf, a nest of rice noodles, a hollowed-out, hole-punched lemon rind—became architectural forms, holding various pieces of sushi. The most unique: octopus sashimi bathed in ponzu and topped with paper-thin slivers of candied lemon and jalapeño. Vying for attention were pairs of yellowtail and salmon nigiri, yellowtail belly and spotted prawn sashimi, and two specialty rolls: the Tootsie Roll and the Special Albacore Roll. Garnishing the plate, an enormous fried prawn—eyes, legs, and all—perched upright in the corner, rooted in a bed of wasabi. What impressed me most was the range—the array would please a table filled with both sushi novices and daring thrill seekers. 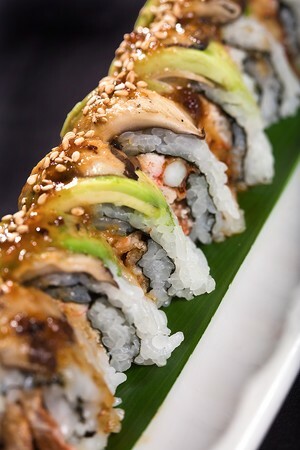 The Tootsie Roll—a baked soft-shell crab roll topped with shitake mushrooms, avocado, spicy-sweet black bean sauce, and sesame seeds—was dominated by flavorful sauce and crunchy textures and barely tasted like sushi. At the other extreme, the spotted prawn sashimi offered an elemental, bare taste of raw shellfish. 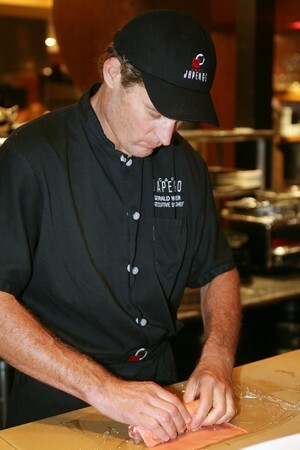 In between, the variety of both traditional and modern preparations showcased Chef Warner’s creativity and expertise. The yellowtail belly was a treat, its succulent meat dissolving on the tongue. Both nigiri were perfectly formed, and most decidedly fresh. The Albacore Roll was lively and colorful—a tempura shrimp, crab, and avocado interior beneath seared Albacore, avocado, scallions, sesame seeds, and red and orange masago (smelt roe). Freshness was the most noticeable trait of each savory bite, and before we knew it our plates were clear. Well almost. Ray pointed out that we hadn’t touched the prawn, promising the intimidating creature tasted like crisp potato chips. Smiling, we took him up on the challenge, and cautiously took a bite of the creepy, albeit delicious, crustacean. Ray returned with glasses of Rombauer Merlot from Carneros, by far the best wine of the evening. Floral, buttery aromas gently suggested we shift gears, as our entrees would prove dramatically different from the sushi—although no less astounding. When the dishes were set before us, I could scarcely believe they were prepared on the same premises as the sushi—the two courses seemed worlds apart. The Prime Rib Eye Medallion, with asparagus, honshimeji mushrooms, crisp fried leeks and port wine sauce, served alongside truffle nori French fries, seemed reason alone to visit. As I savored a forkful of velvety, medium-rare steak, crunchy leeks and glistening demi-glace, I forgot all about fish entirely. The delectable fries were served in a paper-lined cone, as proper frites are, keeping the thin, salty potatoes crisp for as long as possible. The Miso Chilean Sea Bass, with floating vegetables and shrimp tortellini in an Asian truffle broth, was glorious. The aroma of truffles wafted from the wide bowl, enticing even our almost-satiated palates. Bok choy, honshimeji mushrooms, and cippolini onions formed an island in the midst of the broth, elevating the sea bass so that it perched, pillow-like, above the whole dish. Each bite resonated with intense flavors, while remaining light, airy, and almost refreshing. Just as Chef Warner had perfected fish raw, Chef Payne had mastered it cooked. As the bold forms on our plates dwindled, I realized that the duo of entrees perfectly encapsulated our meal. Light and dark, refreshing and savory, from water and land: the characteristics of sea bass and steak formed polar opposites, yet both dishes were immensely satisfying. Like the two menus in the restaurant—sushi and Pacific Rim—our meal somehow seemed complete with both, yet easily could have stood alone with one or the other. Perhaps that, among all the other outstanding qualities, has been the key to Cafe Japengo’s success: not only is there a seemingly endless array of choices, each is masterfully crafted with ingredients of phenomenal quality, promising a tantalizing dining experience no matter what comprises the meal. And then there was the Dessert Medley—a platter with miniature versions of the dessert menu offerings. Like our sushi course, the range of flavors and textures was astounding: Pan-Fried Bread Pudding, Peach-Ginger Sorbet, Banana Chocolate Decadence with fudge-like chocolate cake and caramelized bananas, a Root Beer “Float” with root beer gelato and chocolate straws, Chocolate Lava Cake with vanilla gelato, and Espresso Brûlée. Without the space to describe each, I can only say: please order this dessert. With so much stimulation on the plate, we opted to forgo the after-dinner drinks and enticing sweet martinis in favor of something elemental—a steaming pot of floral tea. As we sipped from clear mugs, I reviewed the astoundingly varied components of our diverse meal, still shocked that all had been sampled under one roof. The only challenge now would be to ensure that every delicious detail locked itself in my memory for a long time. | Bar 5:30 p.m. - 9:30 p.m.
| Bar 4:30 p.m. - 9:30 p.m.
| Bar 4:30 p.m. - 10:30 p.m.
| Happy Hours 4:30 p.m. - 10:30 p.m.
Is there a sushi bar here? Yes. Guests may enjoy custom-made sushi rolls at the sushi bar, expertly prepared by Sushi Chef Jerry Warner. Is Cafe Japengo located in the Hyatt in La Jolla? 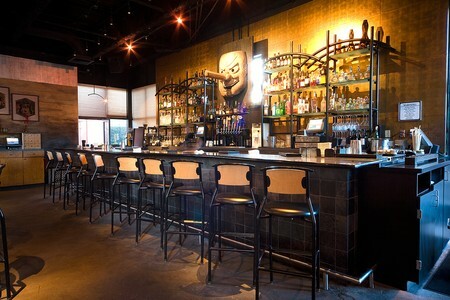 No, but it is located across the street from the Hyatt Regency La Jolla at Aventine. What type of cuisine is served at Café Japengo? 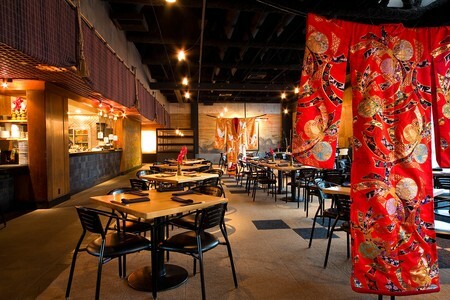 Café Japengo’s lunch and dinner menu items have a fused influence from Asia and the Pacific Rim. They also have a sushi menu. How far are you from the San Diego airport? Yes, Cafe Japengo has a full bar available. CHICKEN, SHRIMP, PORK, AND EGG WITH VEGETABLES. Tempura shitake mushroom, spicy tuna, and crab. Two sauces. Delicious food! Excellent ambiance. Fantastic service...very personable. One of my new favorites! Great sushi, although pricey. Don't go on Thursday nights though; we discovered it's "trolling night" for singles. There were a lot of scantilly-dressed slightly overweight women with a lot of make-up on and some youngish men just wandering around on their cell phones...with roaming eyes. On Sundays they have a sushi special where certain items are on sale. 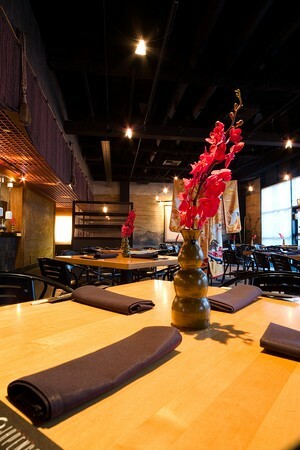 The food is really well presented (sushi and entrees) and the service is excellent. The deserts are the best items but they're not that big so I wouldn't recommend sharing. 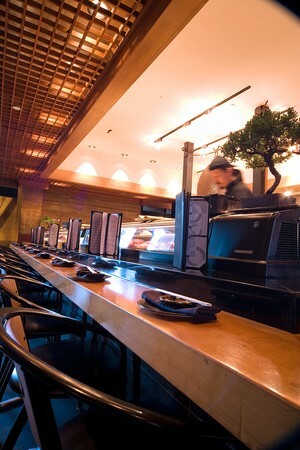 Get a booth facing away from the bar (liquor bar, not sushi bar) if possible to muffle the sound. The music is loud and alternates between U2 and ganster rap. 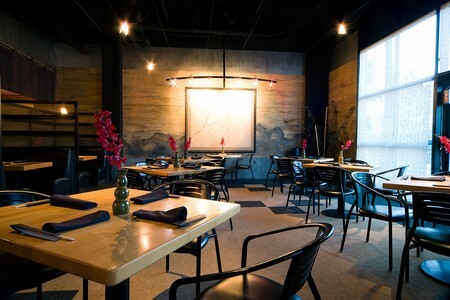 This is a very nice restaurant with a unique sushi menu, great food, and excellent service. 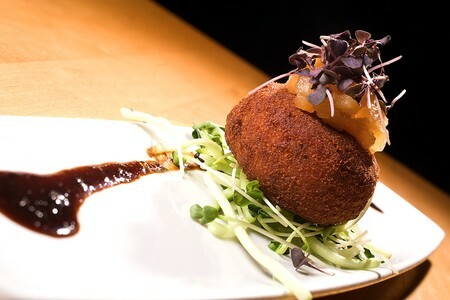 Expect to pay top dollar but worth it for a wonderful dining experience! I've never had bad experience with this restaurant! The food is Amazing, you have to try the Seabass, it's outstanding!! The prices are up there, but you definately get your money's worth. We've always had an excellent service. Thursday nights are the most fun; music, people, it's like a giant party with great food and good looking people! I dined at Cafe Japengo this Saturday and it was outstanding. The sushi was our appetizer and it was fresh and well presented. We rolled into dinner with a few appetizers from the dinner menu, followed by entrees. Everything was wonderful and the service was top notch. I highly recommend it. This place was great. The food was more than excellent. I really like going to great resturaunts away from the mess that is downtown. The food was really, REALY great japanese food. Although they did Americanize it a bit - not that I'm complaining. It's nice to get the authentic japanese but then its also nice to find a place that can change the style up a bit without loosing the "basic's"
The sushi was superfresh, loved the seared scallops entree. We had a great cold sake, we only wanted a glass and it was offered by the glass so we didn't have to buy a big bottle. Our server Julie was not only friendly but funny as well. Our sushi took a little long but we ordered a lot and you could tell that everything was made fresh. I found out they have a great happy hour and a early bird menu so I can go back more often. food sucked overpriced sushi. only good thing there was pretty hostess barely dressed, fast and friendly bartenders. and Parking. From the buzz surrounding this restaurant and the quality of its food, I thought this was going to be a great experience, I was wrong. The atmosphere was gorgeous and the music was fine, but I thought that it was bizarre that the staff started taking away place settings and center pieces from the empty tables while they still had patrons in the restaurant (approximately an hour before closing). We ordered edamame first and it seemed sub par (it was not as good as some that I have had from other places.) Next we ordered four rolls of sushi (from their limited selection.) We sat there for an excess of thirty minutes waiting for it to arrive (this was after the edamame was cleared away.) We did not order one of their specialty dishes (although I must admit that those appeared to be exquisite.) When we finally received our food, we noticed that it was not very fresh. Now I think of myself a fairly experienced sushi eater and I have been to places all over the country, the best having been in New York City, but I have to say that if this is one of the best sushi restaurants in San Diego, I am terrified of trying some of the other less renowned eateries! The only saving grace of this place was that our server realized that we were not happy with our experience and was nice enough to offer us a complimentary desert (which just so happened to be the highlight of the meal!) This was the only reason why I gave this place a two star rating.